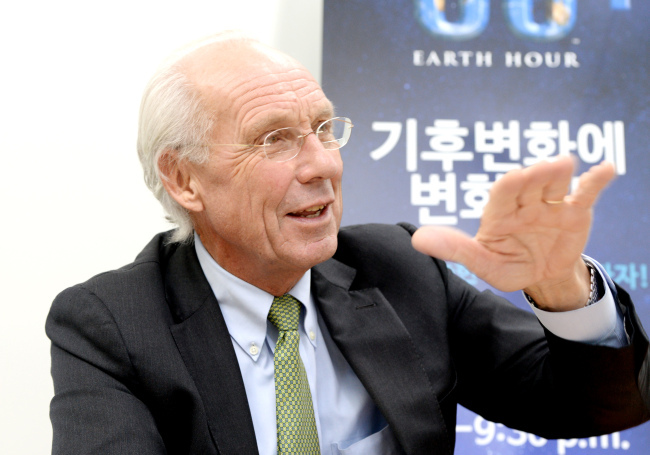 When it comes to curbing climate change, Norwegian scientist Jorgen Randers is a disbeliever. The 70-year-old professor at the BI Norwegian Business School in Oslo has been warning of an impending global environmental crisis for more than four decades. As the clock ticked toward the 2015 United Nations Climate Change Conference, in Paris from Nov. 30-Dec. 11, with the goal to forge a legally binding agreement on reducing greenhouse gas emissions and limit global temperature rise to 2 degrees Celsius, Randers offered a stern prognosis devoid of efforts to look politically correct. He visited Korea to participate in the Seoul International Energy Conference 2015 on Wednesday, where he advised Mayor Park Won-soon on making Seoul a people-oriented city using sustainable energies and policies. For the last several decades, climate scientists around the world have been drumming up gloomy forecasts of floods, droughts, hurricanes, rising seas, devastated agriculture and disappearing wildlife. Randers, who followed his 1972 seminal book with “2052 - A Global Forecast for the Next Forty Years,” in 2012 said he was convinced that over the next forty years the arc of history would tilt toward his grim predictions. His new book describes in detail the consequences and implications of the current path of global development “in the vacuum of extraordinary actions,” covering population, economy, energy, environment and climate. The academic claimed that the world temperature would rise above 2 degrees Celsius by 2052, and 3 degrees Celsius by 2080, where it would stay for roughly a thousand years, the half-life of CO2. Having served as the former director-general of the World Wide Fund for Nature in Switzerland, Randers projected that the low-lying Bangladesh, parts of the Mediterranean and islands in the Pacific were going to be hit particularly hard as seawaters rise about 30 centimeters. The key problem, according to the intellectual, lies in the short-sighted nature of democracy, which caters to immediate populist demands rather than longer-term public interests. Global institutions such as the United Nations had “very limited ability” to administer the critically needed cures, he asserted, as the representative negotiators were constrained by their national parliaments. Unlike the democracies, Randers argued that China’s authoritative style of government was actually better at solving the world’s problems. Highlighting China’s rapid ascendance since the market-oriented reforms were put into effect in the late 1970s, the scholar explained that the Chinese government was “delicately balancing” its interests between wealth creation and growth management. China, which has added a great deal to climate change, is now moving briskly to improve energy efficiency, switching to renewables and limiting CO2 emissions by 2030, under the auspices of five-year plans, he pointed out. For the rest of the world, a brighter future could be obtained by shifting 2 percent of the world’s capital and labor from the “dirty” coal, oil and gas industries to the “clean” wind, solar and hydro energies, he indicated. As necessary steps, he added, population growth must be curtailed worldwide, particularly in advanced countries, to reduce ecological footprints; carbon emissions must be trimmed by taxing polluters and subsidizing renewables; and poverty must be eliminated and renewable energy capacity must be strengthened in poor countries. Randers also suggested promoting a higher environmental awareness and diverse well-being away from materialism. Korea was “rich and civilized enough” to depart from nuclear and adopt renewables, he said, which were becoming cheaper around the world. The professor praised the Seoul government for its sustainable urban policies under the banner “One Less Nuclear Power Plant Policy,” introduced at the ICLEI World Congress in Seoul in April. Declared as the “Promise of Seoul: Taking Actions against Climate Change,” the plans include: cutting CO2 emissions by 25 percent by 2020 and 40 percent by 2030; sharing energy with underprivileged communities; clipping greenhouse gas and air pollutants in an integrated system; encouraging recycling and slashing food waste; saving water; harnessing biodiversity; expanding urban farming; protecting public health from infectious diseases and heat waves; preventing climate disasters; and bolstering related international coalitions. Noting Korea’s world-class expertise in information technology, National Strategy for Green Growth (2009-50) and hosting of international institutions such as the Green Climate Fund in the Songdo district of Incheon, the professor said Korea had the potential to lead the world in sustainable development.